This week started with Lord Robert receiving a telegram which meant he had to dash off to the US to deal with Cora’s brother Harold. Hurrah, I thought here comes Paul Giamatti. Alas, no. Instead Lord G was banished off screen not to be seen again for the entire episode. 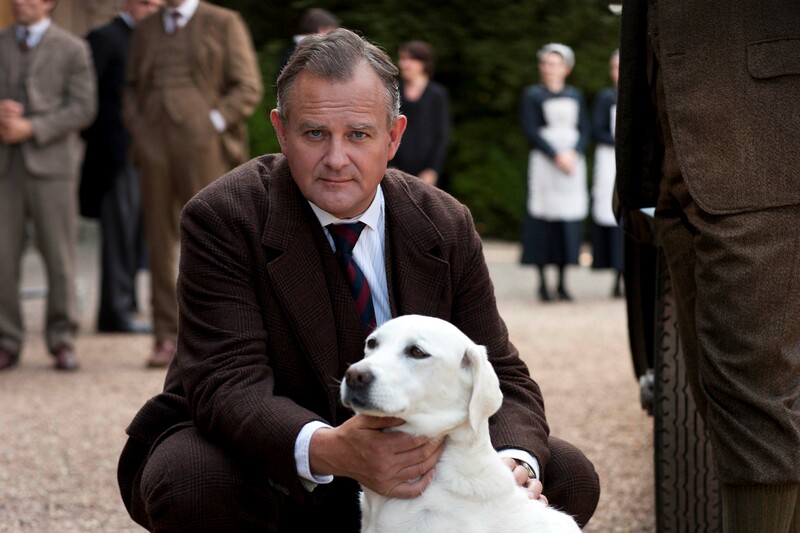 I know Hugh Bonneville hasn’t had much to do this series, but completely writing him out of huge chunks of storyline may not be the best idea. Or maybe he came back and went to visit Sybbie and Baby George in the nursery because everyone forgot about them this week too. The departure of Lord Grantham meant he needed to take a valet with him on his journey, but Mr Bates didn’t want to go, what with his wife being raped and all. So Thomas, the other completely inconsequential character this series, got packed off with Lord G instead. With two departures we did get an arrival, or several arrivals, because the much-discussed pigs turned up – hurrah! Helpfully this enabled Julian Fellowes to come up with a plotline involving Lady Mary, her new nemesis Mr Blake, the pigs and a lot of mud. It ended with her making him scrambled eggs. A Domestic Goddess Lady M is not, but it is a step up from the sandwiches she used to woo Matthew in series one. 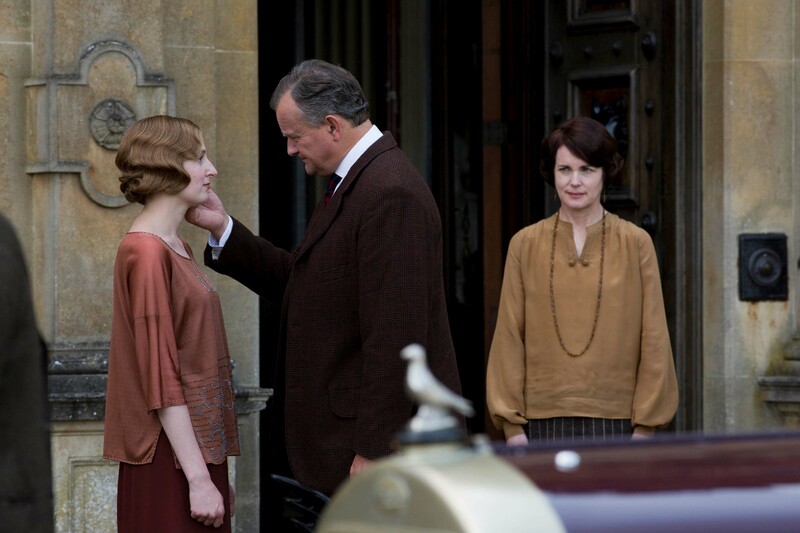 Whilst Mary was busy growing a new relationship, Lady Edith was busy dealing with her growing bun in the oven. Anyone else notice how she’s taken to wearing loose-fitting clothes? Suddenly the story went all Vera Drake on us and she ended up in a backstreet doctors announcing she couldn’t have the baby. And then she changed her mind, so we’re going to have another never-seen baby in the family. I can’t wait to see Cora and Robert’s reaction to the news, at least it’ll give them both something to do (and some screen time). 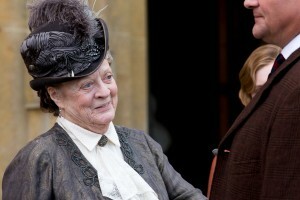 The Dowager was ill this week and took to her bed with a bad bout of bronchitis. Isobel stepped up and offered to nurse her night and day, much to the doctor’s relief. Would you want to give Lady Violet a bed bath? Happily Violet pulled through (as if ITV are going to let Maggie Smith leave the show) and the good doctor helpfully reminded her who she had to thank: ‘You’ll be rewarded in heaven,’ he told the patient to which she retorted, ‘It can’t come soon enough’. As much as I complain about some of the storylines this series, you really can’t fault Dame Maggie or the fabulous lines Julian Fellowes writes for her. And now there’s just one episode left. What will happen next week? Will Mary and Mr Blake reveal their undying love for one another? Will the evil Mr Green get his comeuppance? (The way Mr Bates was looking at the end of this week’s episode, he’ll certainly be getting something.) Will we ever find out what happened to Lady Edith’s Mr Gregson? Will someone (please) push Lady Rose into the river when she goes rowing with Jack Ross? And will anyone remember the children? Won’t someone remember the children!